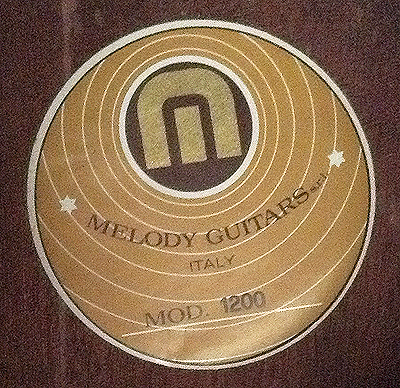 Melody guitars were made from 1961 in Potenza Picena, Italy. 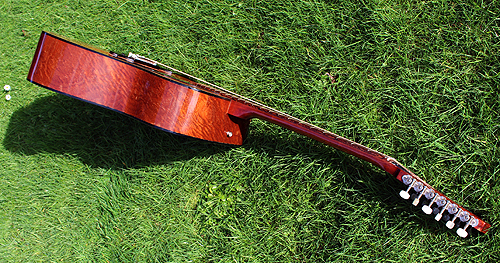 The company produced electric and acoustic guitars until 1965 when they were joined by the EKO instrument company. From 1965 until 1972 all the guitars made at the factory were branded Eko and were in effect the Eko range. Then from 1969, the Melody name and label was reused for some instruments that were made at the factory but were a bit more individual than the Eko design. After 1972 Eko parted company with Melody and the name continued until 1988. 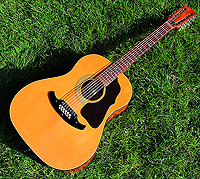 This 12 string is from around 1969 due to its design and label. 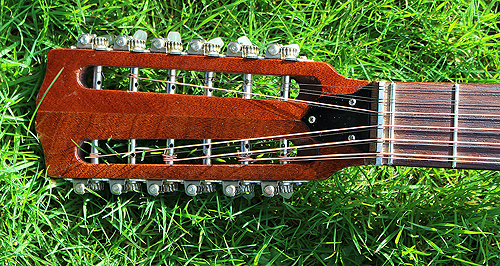 The guitar is a 12 string model featuring 6 a side tuners with double holed shafts. 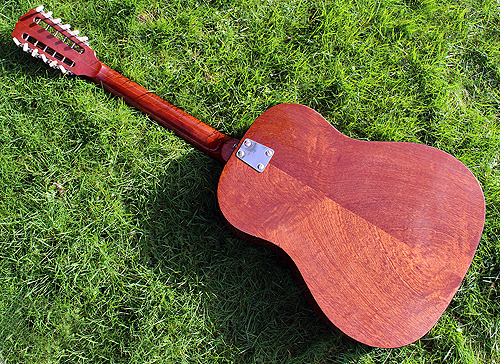 The guitar is quite heavy and the choice of finish on the back and sides is very attractive and well constructed. It’s a good looking guitar. It features a large solid bridge with an adjustable screw saddle made of metal and a dark hard material that I can’t identify. The neck is bolted on through the body very securely. There is a zero fret on the guitar and the intonation is not bad considering it is a 12 string model from the late 1960s. The truss rod works, but is set right at the edge of tension and I have not adjusted this. 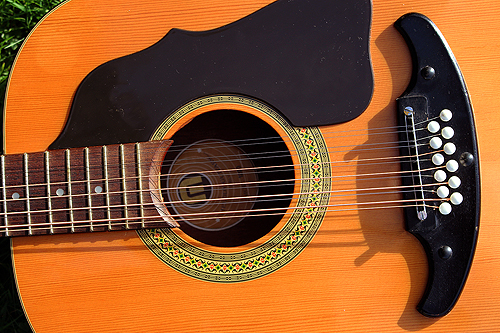 The tension of 12 strings on the neck when tuned to concert pitch on an acoustic guitar is twice that of a 6 string guitar. The tension of the strings largely controls the straightness of the neck so I have left this alone. There is plenty of height adjustment on the screw saddle on the bridge and this would be the best way to adjust the action if so wished. The guitar plays well and has plenty of separation. It produces a light sound with plenty of sound separation between the lower and lighter strings removing that boomy tone that many 12 strings have. 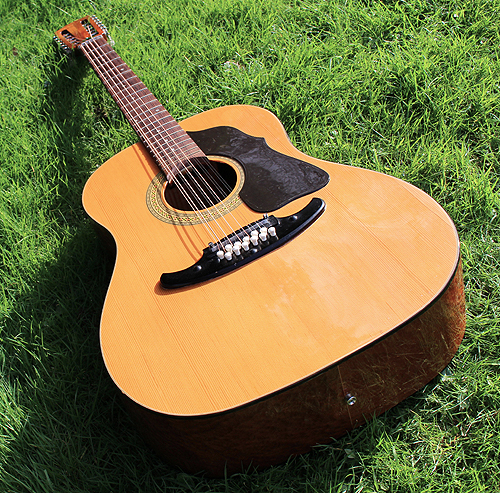 This guitar would probably be suitable for finger picking and recording, rather than busking or live performance. The condition is very good for its age with no heavy dints or knocks. 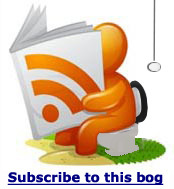 It looks 100% original and doesn’t appear to have any mods to it since it left the factory in the late 60s. It has the same problems that most Italian 12 strings of the 1960s and 1970s which is mainly to do with weight. This guitar is quite heavy when compared with newer models. Overall this is a great looking guitar that makes a surprisingly sweet noise. It is essentially a late 1960s Eko guitar similar to the Eko Ranger but with a more designer artist inspired look.